Why should you quit sugar? Average American consumes triple the daily recommended amount of sugar. It’s not hard to do when 74% of packaged food sold in supermarkets contain added sugar. The goal of this challenge is to help you kick-off that sugar addiction you might be having and understand what exactly sugar does to your body and brain so you can take more informed actions. Even Jennifer Lopez recently did a 10-Day No Sugar Challenge, and got amazing results (just look at her abs here) – she liked it so much she’s doing it again Good thing, our challenge is not that extreme, as you can still eat carbs, so it will be much easier to follow. But, you can still expect great results nevertheless! "Sugar is more powerfully addictive than alcohol, cocaine, or even heroin. And if you’re thinking about going for diet soda instead, take note: artificial sweeteners may be more addictive than regular sugar." Have you ever thought about what it would feel like to get rid of sugar and detox your body? How does it feel to overcome these sugar cravings step by step? Then it’s time to quit your sugar addiction! 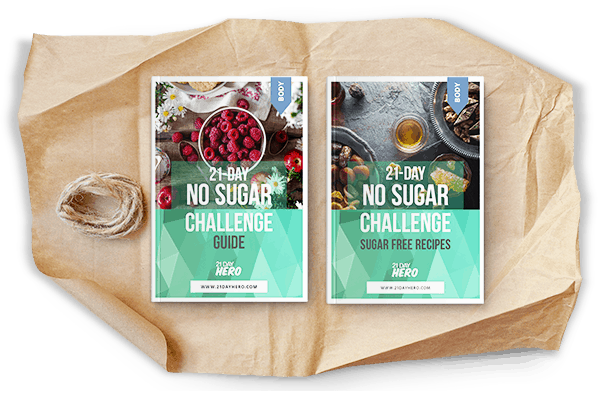 The 21-Day No Sugar Challenge provides you tools to avoid added sugar in a consistent way + ongoing e-mail check-ins packed with tips, recipes & educational videos to keep you motivated and engaged over the course of 3 weeks. And the best part? Through regular check-ins, we break down all the information you need to know in short digestible format and deliver it day after day, following the methods of habit building. You simply DON’T want to miss this! Doing No Sugar challenge let me face the truth of how much sugar is hiding in our food. Although I still eat sweets time to time, I'm no longer addicted to them the way I used to be. .. the best thing that my body is much happier without sugar. I feel better, my skin looks much younger and I even lost few kilos 😉 Thanks to 21 Day Hero for the support - I must admit, I wanted to quit during the challenge, but your daily encouragement made me stick to it!! It wasn't that tough as I thought. Doing the challenge helped me to realize how much added sugar there is around us, especially in things that I normally didn’t consider being sugary. Until you (21 Day Hero) pointed them out, which was a great eye-opener! I have now definitely improved my eating habits and am feeling better than ever. I dropped 2 kg within the first week, even if I was eating more food compared to before the challenge!!! For the first time my abs started showing off and best of all, my skin cleared out from Acne! After the challenge, I stopped craving for sugar and have now done the challenge 3 times already! chose to improve Their lives. You receive confirmation and the Challenge Guide (pdf) and the Sugar Free Recipe e-book (pdf) straight to your inbox. To make sure you’re getting the most of your challenge, our habit coaches and the community of people on the same journey will be available for you, whenever you got any questions. You can start as early as TOMORROW! In the sign up form you will be able to choose the date you want to start this challenge at. A lot of people choose to start on Monday and that works great. The only thing you need to remember is to always choose a date that is at least 1 day ahead in order for your encouragement emails to be triggered! Once you sign up for the program, you’ll receive a confirmation e-mail with the next steps described along with the Challenge Guide Ebook and Sugar Free Recipe Ebook. Let’s be honest, free things do not motivate us. Cognitive psychologists found out why and they call it loss aversion. In simple terms, we are more motivated by fear of losing rather than a satisfaction of gaining. It might sound counter-intuitive, but by paying for this challenge, you have a higher chance of successfully completing it and therefore enjoying all the benefits associated with avoiding all added sugar. Also – it supports us and our team to keep providing you a ton of useful content that we share every week for free. How do you handle my data? In the days when we might feel like our data is mistreated more often when we want to, at 21 Day Hero we put a great emphasis on making sure your privacy is respected at all times. Reach out to us on hello@21dayhero.com and we will answer any questions you might have. It’s so much more fun and motivating to do it together!